Pathologies with high death rates such as cancers may well have found their solutions with the rise of nanotechnology. Nanotechnology is a newly coined word encompassing the application of nanoparticles for all kinds of technological challenges. A nanoparticle is simply a particle, such as a sphere, with dimensions at the nanometer scale, that is, one hundred thousand times smaller than the diameter of a human hair. In the context of biomedical applications, the use of nanoparticles to better treat and diagnose diseases has been extensively investigated and applied in academic and industrial groups. This is the so-called “nanomedicine”, the promising medicine offered by nanoparticles. Fig. 1. 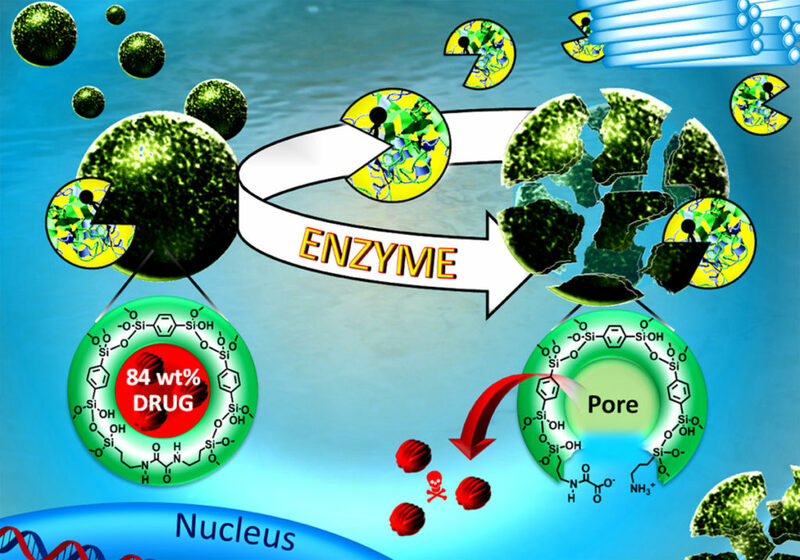 Artistic representation of the enzyme-mediated degradation of nanoparticles for the selective delivery of drugs to the nucleus of cancer cells. But why would the use of nanoparticles offer a real alternative to current cancer therapies such chemotherapy? Chemotherapy treats ill patients with anti-cancer drugs, which are essentially poisonous molecules which kill cells, but the poison also damages healthy tissues and organs and thus generates severe side effects. In the best case scenario, the cancer is removed before the life of the patient is threatened. In other cases, however, the lack of selectivity of the anti-cancer drugs will cause severe damages to the health of patients, causing the termination of the treatment, or worse. However, by using porous nanoparticles which act as nanosponges that encapsulate thousands of drug molecules, the drugs can be transported and delivered selectively to the cancer site. Nanomedicine thus promises to prevent most side effects caused by current cancer therapies. However, there is a major drawback to the real-life applications of most of the nanoparticles investigated by the scientific community: the potential toxicity of bio-accumulated particles in the body. Once the nanoparticles have delivered their drug content to the targeted site, their fate is generally unknown and may hence cause health risks. For example, many metal nanoparticles have been applied for therapeutic and diagnostic applications but the absence of particle biodegradability has prevented, in many cases, their official approval as new drugs by agencies such as the Food and Drug Administration (FDA) in the United States. Fig. 2. Transmission electron microscopy images of nanoparticles before and after the enzyme-mediated degradation. On the contrary, biodegradable drug delivery nanosystems such as liposomes have been approved by the FDA and are currently applied for cancer therapies. Liposomes are flexible organic capsules which can hold significant amounts of drugs. Nonetheless, while their flexibility renders them biodegradable, it is also known to cause the partial disruption of the capsules outside of the cancer site which leads to side effects. In our work, we designed biodegradable porous organosilica nanoparticles of 100 nanometers which displayed unprecedented drug loading capacities and could autonomously deliver drugs in cancer cells upon the pH change associated with their internalization inside these cells. The rigidity of these porous nanoparticles allowed a higher drug loading (up to 84 % in weight) than that of liposomes (e.g. 30 % in weight) without drug leakage for a greater control of the drug delivery in cancers. The paradigm shift presented in our work is the enzyme-mediated degradation of the organosilica nanoparticles. Silica is an inorganic material which is known for its biocompatibility and its slow dissolution in aqueous media. Therefore, in order to obtain rapidly biodegradable siliceous particles we prepared particles with 50 % of phenyl and propyloxamide organic content. The oxamide groups mimicked the amino-acids present in the body and on that basis the trypsin model enzyme was applied to cleave oxamides much like metabolic biological processes. This finding represents the next generation of hybrid nanoparticles tailored for drug delivery into specific protein-containing organs for disease-targeted treatments. The tailored design of enzyme-eatable nanoparticles may allow even more selective therapies to predetermined cancerous organs in the near future.